Mr Yamauchi ran the firm for 53 years, and was its second-largest shareholder at the time of his death. The company confirmed the news in an emailed statement. 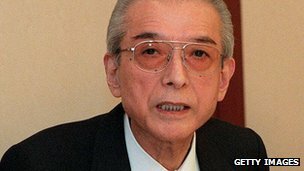 A spokesman said the firm was in mourning over the "loss of the former Nintendo president Mr Hiroshi Yamauchi, who sadly passed away this morning." Mr Yamauchi ran the company from 1949 until 2002. In that time, he took what was a small-time collectable trading card company and built it into one of the most recognisable - and successful - video games brands today. "You cannot underestimate the influence the man had on the games industry," Rob Crossley, associate editor of Computer and Video Games magazine, told the BBC. "He spearheaded Nintendo as they moved into the arcade business, with hits such as Donkey Kong. "This man was the president of Nintendo during the NES, the SNES, the N64 and the Gamecube - the first two were transformative pieces of electronic entertainment."